Home / houses for rent in Mattoon, Illinois / Renter’s Insurance and why you need it. 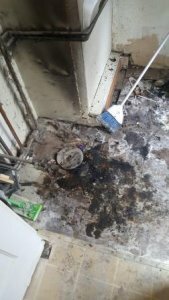 What happens to you when the home you are renting catches fire? Where will you live while repairs are being made? Who pays for your ruined personal belongings? These are real tough questions residents face everyday. The answer is that if you don’t have renter’s insurance, YOU will pay to replace your stuff. The above picture is what happens when you sit trash in front of a water heater. The resident, who made a simple mistake, would have had to replace $10,000 worth of his own personal property in addition, he had to spend 2 weeks in a motel. These expenses would have come out of his own pocket had the renter’s insurance policy not been in force! Renter’s insurance today costs about $8 to $15 dollars a month. You can’t afford to not have it! All Painted Lady residents are required to have renter’s insurance. We don’t sell insurance but we can help you with getting it. Click on the link below and get a free quote from our friends at Agency One Insurance.